Wednesday’s press conference in Hollywood wasn’t the first time Donnie Nietes and Aston Palicte had laid eyes on one another. The two hail from the same province in the Philippines, Negros Occidental, about an hour’s drive from one another. Palicte has already fought Nietes, Gerald Nietes, that is, a cousin of the three-division world titleholder known as “Ahas”, defeating the lesser known Nietes in an amateur bout several years ago. So, Palicte owns a 1-0 record against the Nieteses. It’s a mark that Donnie has designs on evening up on September 8 when they meet on the HBO-televised SuperFly 3 card. “This is what you call revenge,” said Nietes, who will be seeking a fourth world title in as many weight classes when he and Palicte clash for the vacant WBO junior bantamweight title vacated by Naoya Inoue when he moved up to bantamweight. Nietes (41-1-4, 23 knockouts), a long overlooked, technically gifted fighter whose consistency has earned him a spot on The Ring’s pound-for-pound list, will be appearing for the second straight time on HBO after his impressive seventh round knockout of Juan Carlos Reveco in February, also at The Forum in Inglewood, Calif.
Palicte (24-2, 20 KOs), rated No. 2 by the WBO, isn’t as accomplished as his fellow Negrense rival, but has the advantage of having been a 115-pounder for the past four years. He’s also several inches taller than Nietes at 5-foot-7, and is nine years younger at 27. “We cannot underestimate Aston because he’s big and he’s still young. He’s training well because he also wants to get a world title,” said Nietes, who has held titles at 105, 108 and 112 pounds. “When you are fighting a guy who has everything to gain and nothing to lose it is always dangerous,” adds Nietes’ promoter Michael Aldeguer of ALA Promotions. Palicte also has the added advantage of being trained by Rodel Mayol, a former WBC junior flyweight titleholder who knows Nietes’ style well from their days sparring one another at the ALA Gym in Cebu City, Philippines. Palicte has trained with Mayol for his last four fights, and looked his most impressive last time out, cranking uppercuts on Jose Alfredo Rodriguez for a fifth-round stoppage last December. “Aston wants to prove that he is the strongest of the division,” said Mayol, who will finish up Palicte’s training in Los Angeles after Palicte did his early training at Sanman Gym in General Santos City, Philippines. Nietes meanwhile will be preparing with trainer Edmund Villamor and conditioning coach Nick Curson for the duration of camp in California. Palicte will be the first Filipino opponent Nietes will have faced since 2006. It will be the second all-Filipino world title fight in the past four months, following Jerwin Ancajas’ points victory over Nietes’ stablemate Jonas Sultan in May, after a 93-year gap since the last one. The relative proliferation of these Filipino vs. Filipino title fights underscores the advances the country has made on the world stage beyond Manny Pacquiao, but it can also present a quandary for some countrymen who have a tough choice to make about who to root for. “It’s like your two favorite teams making it to the NBA Finals,” said Jason Soong, manager of Palicte. “I’m proud because I see Filipinos on top. You can really see the greatness of Filipinos. Because right now it’s Filipino vs. Filipino already. That means there are already many great Filipino fighters,” said Nietes. While Sultan’s awkward style didn’t mix well with the southpaw boxing of Ancajas, leading to frequent headbutts and boos from a hostile crowd in Fresno, both camps are hopeful that cleaner offense from both fighters and more traditional boxing styles will lead to a more entertaining fight this time around. “Both guys are gentlemen outside the ring but I know they’re going to give it all or at least die trying,” says Soong. 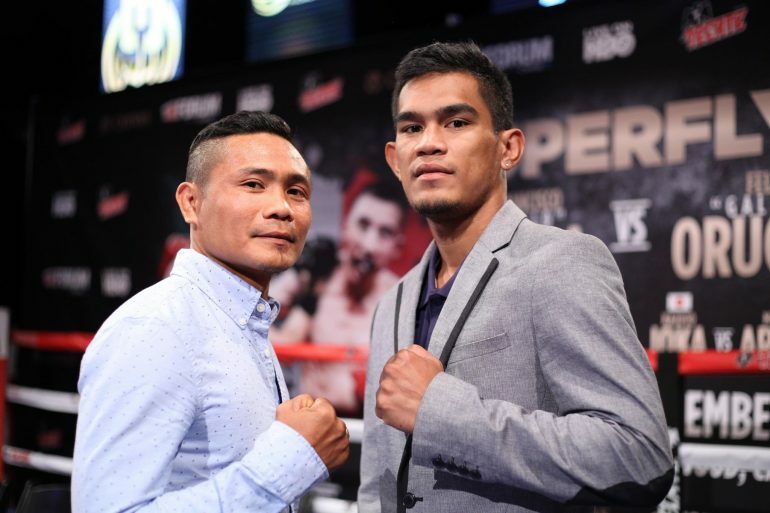 Nietes hopes that the exposure on the third SuperFly installment, which is headlined by Juan Francisco Estrada vs. Felipe Orucuta and includes the U.S. debut of Kazuto Ioka, will open up opportunities for the big fights which have eluded him throughout his career against the likes of Estrada, or The Ring junior bantamweight champ Srisaket Sor Rungvisai, or the returning Roman “Chocolatito” Gonzalez. Aldeguer says that, while the plan of HBO and SuperFly promoter Tom Loeffler of 360 Promotions is to keep Nietes in the mix for “the biggest fights” in one of the sport’s hottest divisions in 2019, they’ve got to handle the business in front of them. “That is the goal and the plans of HBO and [360 Promotions head Tom Loeffler], is to bring the biggest fights at 115. Donnie knows he cant look past Palicte, he needs to take care of business first on September 8 before we can even talk about the bigger fights for 2019. Asked whether he felt his longevity (he’s been unbeaten since 2004) has earned him a spot among the greatest fighters in his country’s rich boxing history, Nietes answered not yet. But he figures a lot can change if he gets the contracts for what he calls his “dream fights”.